A car park at Linz Airport spanning 3,000 m² was covered using funnel-shaped membranes joined together giving the airport a highly visible, modern impression with this extraordinary design. The inner membrane hides the steel construction, although the shadows cast on the membrane, which change throughout the course of the day indicate the presence of the supporting structure. 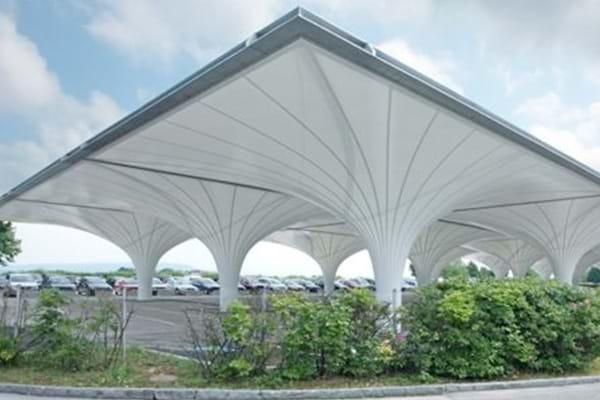 A PVC-lined polyester membran with 10 per cent light transmission and seven per cent solar transmission is used as roof panelling, which keeps the light within the car park and the vehicles are prevented from overheating. ZINKPOWER Moson hot-dip galvanized the steel frames on which the funnel membranes were fastened. A total of around 145 tonnes of steel and 3,400 m² of membranes were used.